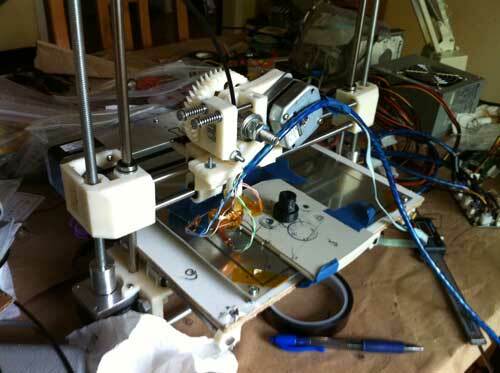 My Printrbot from the Printrbot’s Kickstarter Campaign was supposed to arrive in February. Unfortunately, due to the huge number of supporters they received, the schedule has been pushed back, and I doubt I’ll receive mine until late May. In the meantime, I’ve been getting antsy waiting for mine to arrive, so I decided to go ahead and build one from scratch. The Printrbot that I ordered is actually the laser-cut model. John Seaber of JDS Labs was kind enough to send me the printed bits and a complete extruder for the RepRap version of Printrbot. I already had most of the other parts needed to build a Printrbot, except for the threaded rods and miscellaneous nuts and bolts. I had 4 used steppers gutted from laser printers (which I bought from Wildseyed), and a stepper for the extruder plus smooth rods from Epson Stylus Color 600 ink jet printer that has been gathering dust for more than 10 years. There is a decent Printrbot BOM on printrbottalk’s wiki; a few bits here and there are missing, but it still saved me a lot of time. The nuts & bolts were all easy to find at a local hardware store, except for the M3 screws. The M3 screws were the only parts I had to buy for which an SAE equivalent simply wouldn’t do, since they had to mate into threaded holes in the motors. I ended up wasting a whole afternoon going to several hardware stores, and almost gave up, before finally finding them at Ace Hardware. It’s amazing how difficult it is to buy metric parts in the US. Since I had already been experimenting with my own variations on Wildseyed’s Hot End, I already had a hot end built and ready to go. 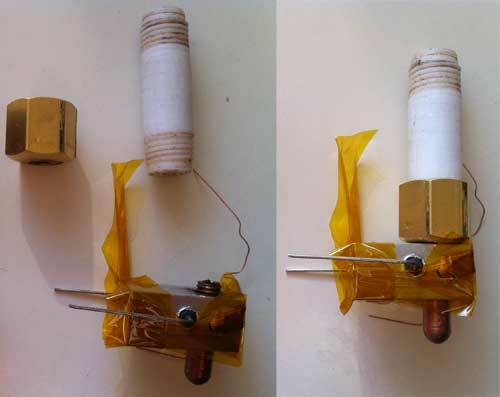 My modifications on Wildseyed’s design are 1) it can be completely dissassembled for cleaning 2) the brass barrel is shorter, has less mass, and screws on 3) I’m using a radial resistor embedded in the aluminum block, rather than attaching an aluminum-cased resistor to the outside. 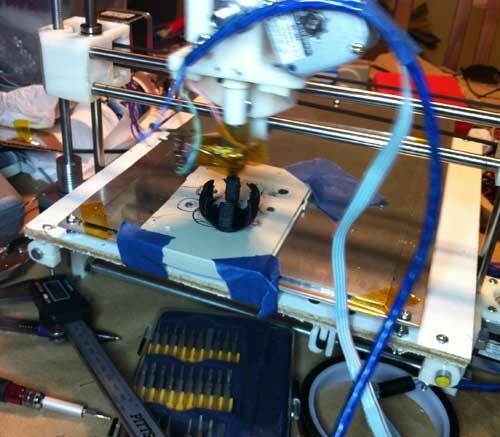 Unfortunately, the extruder I received was set up for a different mount, so I had to adapt it. A trip to the hardware store yielded a PVC pipe elbow, that, as luck would have it, had the exact inside and outside diameters to form an adapter for my hot end. I cut out a small ring, and attached the hot end with M3 grub screws. One thing I learned while assembling this printer is that LM8UU bearings need precise alignment, or they will bind very badly. 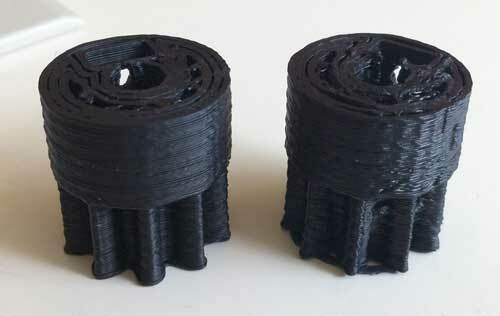 The bearings in the Printrbot’s x-carriage are press fit, which is great for simplicity, but can cause headaches if the parts aren’t printed perfectly. Initially, my carriage was binding very badly, and would barely move. Even worse, the LM8UU’s were gouging deep grooves into my smooth rods. This is because of two factors 1) the spacing of the x-carriage smooth rods was slightly different between the left and right sides of the carriage, due to imperfections in the printed rod holders and 2) the holes in the plastic x-carriage piece I received were not perfectly parallel. After some cleanup of the holes with a rasp in my drill press, I got everything to line up, and the carriage now moves smoothly. I had a similar problem with the smooth rods of my z-axis. 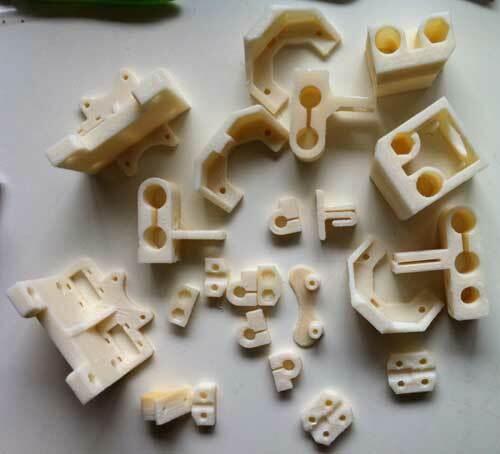 The rods on the y-axis ride on 2 LM8UU’s which are stacked on top of each other, and press fit into a printed plastic block. Again, due to minor imperfections in the print, the stacked bearings didn’t line up perfectly, and my z-axis bearings were binding quite badly against my smooth rod. I was lucky that I was able to pry them out, because they were a very tight fit. Again cleaning up the holes with a rasp on my drill press fixed the problem. All in all, there was a maddening amount of tweaking and coaxing involved in getting my Printrbot assembled and calibrated. My x-motor’s shaft was a bit to short so I had to cut down its mount a bit. This in turn, caused problems with the alignment of the belt and idler bearing. 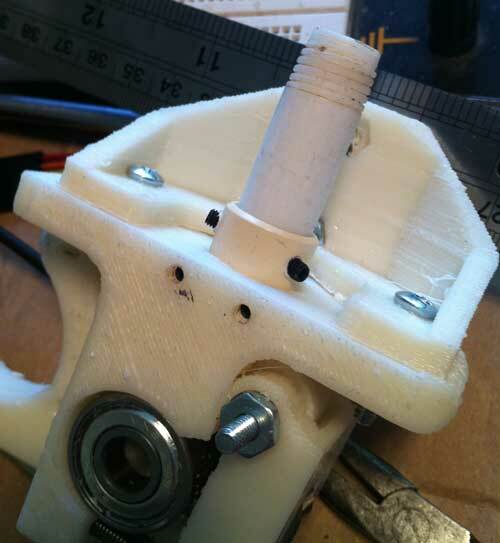 The z-motor mount dimensions were a bit off, so the threaded rods were tilted inwards, rather than parallel to the z-axis smooth rods. I had to re-drill the holes to achieve the proper alignment. The couplers between the z motors and threaded rods didn’t quite fit right, and caused the rods to wobble. I solved this by switching to aluminum couplers. The crimp on pins that I bought from Ultimachine didn’t fit into the Molex hoods I bought, so I had to improvise the connections to my Printrboard. I decided to use CAT-5 for wiring my Printrbot. It’s cheap and has a jacket, so cabling is tidy. Since the cable has more conductors than I need, and the gauge of the wires in CAT5 is relatively small, I used one twisted pair for each connection. I still need to attach end stops, build the hot bed, and get a 12V power supply with higher output to power the hot bed. In the meantime, I was itching to crank out some test prints. The problem is that it’s very difficult to get the molten ABS to stick to any cold surface. I finally decided to try something crazy … print ABS on ABS. I printed on a piece of the Epson Stylus Color 600 printer from which I salvaged the motor that I’m using for the extruder. The first object that I printed was a replacement foot for my Vitamix. My Printrbot is running Marlin firmware, which I adapted to run on Printrboard, and I’m using either Pronterface and Repetier host software, depending on my mood. Currently, I’m using Slic3r to convert STL’s to GCODE. While calibrating the printer, I found that the carriage and build plate vibrate quite a bit, and the motion is not completely smooth. 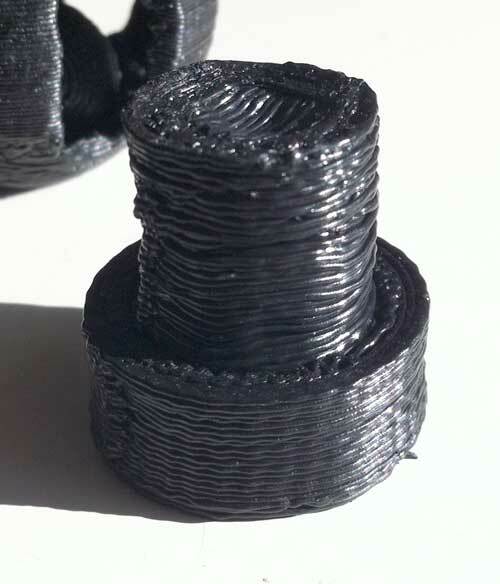 This wobbling can be seen in my test prints. Hopefully, the excessive vibration is due to a modification that I made to the design, as opposed to an intrinsic problem in the Printrbot. Because my rods came in 3′ lengths, I extended all of the rods from 10″ to 12″ long. I am finally able to get some decent prints. In a future article, I will discuss my current printer settings. 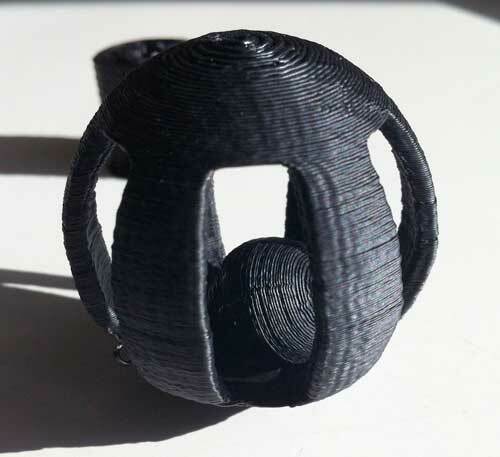 I made the mistake of selecting a very challenging object as my second print, Surveyor’s Cat Toy. The print actually failed because 1) my extruder jammed, due to a stray piece of plastic which fell into it and 2) my ABS printing surface started warping too much. I need to get my heated bed working before I can print large parts. 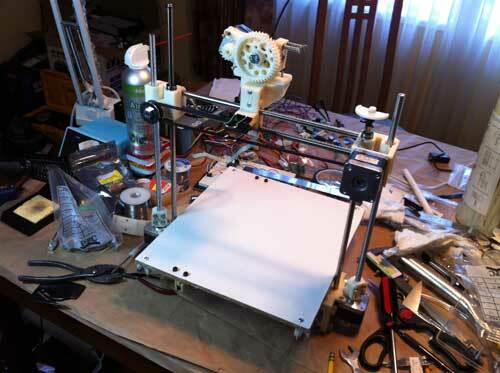 There are 2 Comments to "Printrbot Build"
Thanks for sharing your experiences. There are so many variables between price, precision, learning curve and so on. 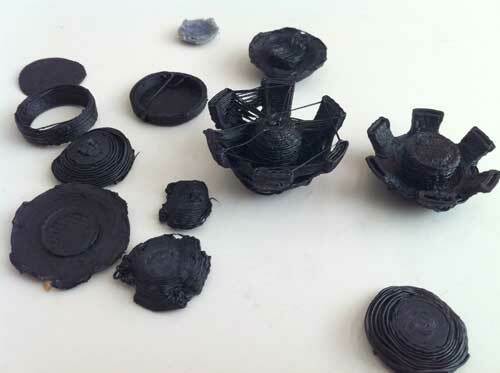 It’s an exciting time in 3D printing. Thanks for your contributions! Thanks for the feedback. I tore my Printrbot almost completely apart and reassembled it with a lot of tweaking, and it prints a lot better now. Must less vibration and more precision, but I still have some issues with the design … I will discuss this in greater length in an upcoming article.